The Russian cruise missile strikes against ISIS targets carried out by a combination of air and naval assets drew attention to a relatively obscure component of the Russian armed forces, namely the Caspian Flotilla. While it is not a very large military force, its importance is much greater than numbers would suggest, as its mission cannot be accomplished by other forces of the Southern Military District. The core of the force are two Gepard light frigates, Tatarstan and Dagestan, one Molniya missile corvette, three Buyan gun corvettes, and three Buyan-M missile corvettes, supported by several smaller gunboats and minesweepers. Dagestan and the three Buyan-M’s are the Caspian Flotilla’s long arm, as each of the four ships carries 8 launch tubes for Oniks and Kalibr cruise missiles which give the ships the ability to strike targets 3,000 km distant. These four ships launched a total of 44 Kalibr missiles against ISIS targets in Syria in two separate operations. Six more Buyan-M ships are to enter service with the Black Sea Fleet by 2018 to hold in check US anti-ballistic missile installations in Romania, and since the two seas are connected by the Volga-Don canal permitting ships with draft of up to 3.5 meters to travel between the seas, all nine Buyan-M ships with a total of 72 cruise missile launch tubes could be concentrated in either of the two seas if the situation requires it. 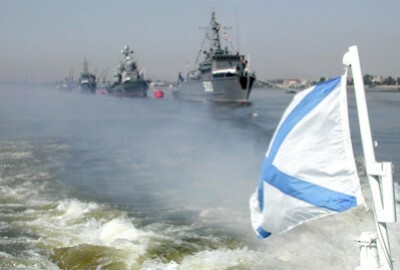 The Caspian Flotilla also has a ground component in the form of two Naval Infantry battalions supported by 8 small amphibious assault craft capable of carrying one complete battalion in a single lift, which gives the flotilla an ability to deliver troops quickly to any point on the Caspian Sea’s coastline, supported by the rapid-fire artillery and multiple rocket launchers of the frigates and corvettes. The one weakness of the flotilla is that its ships have weak air defenses, and therefore would have to rely on Southern Military District’s land-based air defenses and fighter cover. Nevertheless, it is easily the most powerful naval force in the Caspian even when it is not reinforced by Black Sea Fleet units. While the cruise missile capability is what earned the flotilla its media exposure, it also carries out many other missions which are just as important. It protects the Caspian Sea pipelines and drilling installations against terrorist attacks and covert actions by unfriendly states, prevents piracy, smuggling and illegal fishing operations. The presence of the Russian ships in the Caspian deters other countries from attempting to resolve disputes over drilling rights through violence and guarantees Russia the ability to maintain a maritime route to Iran even in the face of opposition by other Caspian countries. The flotilla’s pacifying presence is an important factor promoting Eurasian integration and preserving the security of the New Silk Road and also a barrier against Turkey’s attempts to establish its own sphere of influence in Central Asia. This final role of the Caspian Flotilla may become more important in the coming years, considering the recent increase in tensions between Russia and Turkey. Three of the countries bordering the Caspian Sea, Kazakhstan, Azerbaijan and Turkmenistan, are members of the Turkic Council and have sought military and technical assistance from Turkey and the United States. The Islamic State’s activity in Afghanistan is on the rise, and ISIS international sponsors might decide to use it to destabilize post-Soviet Central Asian states in order to distract Russia from other global issues. The fact that the economies of Central Asian countries are being hurt by the drop in oil and natural gas prices makes them susceptible to destabilization. All of these factors mean that the Caspian Flotilla will remain on the frontlines of the current global hybrid war for years to come.